What’s Happening To The Stock Market? Clue: Don’t Hold Your Breath. The global financial crisis of 2007-08 had shaken the faith of investors. But in the subsequent period that began in March 2009, the stock market made tremendous gains. In a little over nine years, it registered an increase of over 300%. However, the longest-running bull market in modern financial history could be losing steam. The Dow Jones Index, which includes the top 30 publicly traded U.S. stocks, lost 1,389 points over a two-day period. At the opening of trade on October 10, 2018, the Dow stood at 26,442. By the time that the market closed on October 11, the Index was at 25,052. The S&P 500, which is the bellwether index for American stocks, did no better. It lost 145 points in these two days, falling from 2,874 on October 10 to a level of 2,728 by close of trade on October 11. Why has the stock market moved downwards? More importantly, is this an aberration or the beginning of a trend? The answer to the second question will play out over the coming weeks and months. The reason for falling stock prices may lie in the recent increase in interest rates. The U.S. Federal Reserve had maintained the federal funds rate at close to zero for years to get the economy back on its feet after the 2008 crisis. But with the improvement in GDP growth, it began raising the rate steadily. The American economy is now in a strong position. Unemployment stands at 3.7%, the lowest in 50 years. Second-quarter GDP growth is at an annualised rate of 4.2%. This is the sharpest increase since Q3 2014. Today, the Fed rate is 2 to 2.25%. It is expected to rise to 2.4% by the end of the year, 3.1% by end-2019, and 3.4% in 2020. What’s happening to the FANG stocks? Tech stocks have been at the forefront of the bull rally. The FANG quartet – Facebook, Amazon, Netflix, and Google (Alphabet) – made tremendous gains over the last year. But that seems to have changed. Netflix has lost 11% in the last week. Amazon is down by 10%. Even Apple, the world’s most valuable public company, has not been spared. Its shares dropped by 4%. The NYSE FANG+ Index has dropped by 8% in a matter of days. The Index includes Apple, Tesla, Alibaba, Twitter, and Baidu. Even after the fall in tech stock prices, many investors think that the sector remains overvalued. There’s a unique feature to the recent stock market reversal. Bond valuations are plummeting in sync with share prices. They usually have an inverse relationship. A Bloomberg report points out that this has happened only thrice in the last two decades. In each of these instances, there was a negative effect on equity valuations. The rout in bond prices has resulted in record withdrawals from exchange-traded bond funds. 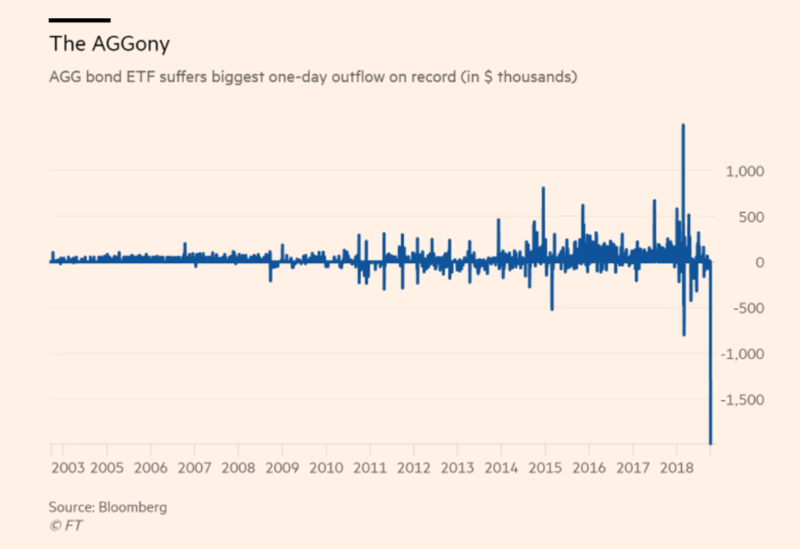 Blackrock’s flagship debt ETF, the iShares Core US Aggregate Bond ETF (AGG) saw an outflow of US$2 billion on October 9, a record for a single day. The rise in bond yields is expected to continue with other central banks joining the Fed’s lead in raising interest rates. The Dow plunged by over 800 points on October 10, 2018. That’s one of the most massive single-day drops ever. 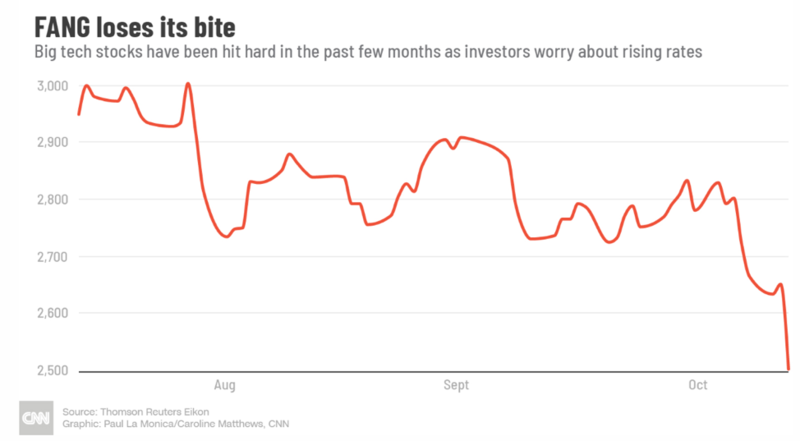 Stock market volatility has increased sharply in recent times. In earlier years, the single-day drops in the Dow were much lower. 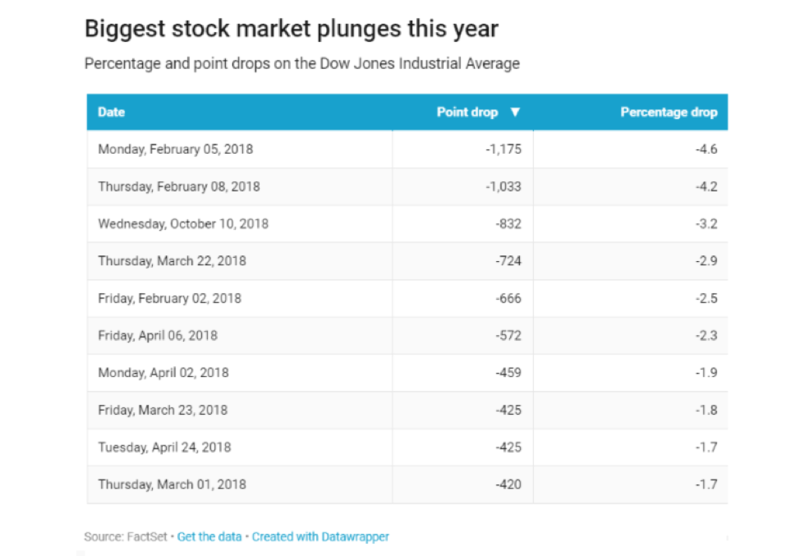 In the period up to 2017, the largest decline in a day was on September 29, 2008, when the Dow fell by 778 points in the aftermath of the global financial crisis. Even the 9/11 terror attacks resulted in a relatively subdued fall in stock market valuations. On September 17, 2001, the first day of trading after the Twin Tower collapse, the Dow fell by a comparatively low 685 points. 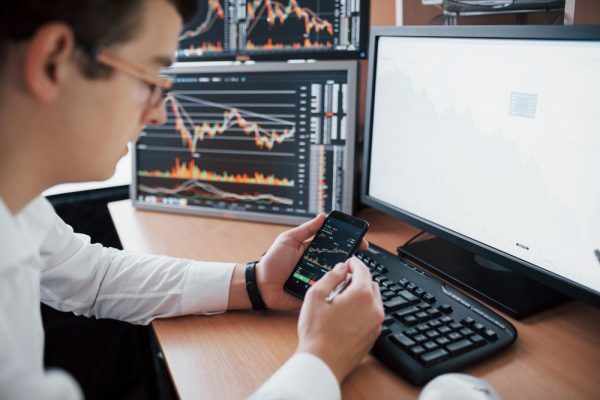 When the stock market was moving upwards, many investors wished for a correction so that they could buy at reasonable valuations. Now that the market has plunged, they are not so sure if this is the right time to invest. Is it safe to buy at these levels? Or should you wait a little longer for the market to bottom out? Why did the market suddenly plunge? I have no idea. Will it keep going down, or bounce back? I have no idea. Is this going to translate into problems for the real economy? I have no idea. But what you need to know is: nobody else has any idea, either.